As women, our hormones normally fluctuate in a cyclical manner over a time frame of 21-35 days. Each month, our body prepares for the possibility of a pregnancy. If pregnancy is not to be, we have a period and then start the cycle again. During the first part of the cycle, known as the follicular phase, follicle development occurs in the ovary. The developing follicles produce the hormone oestrogen, which stimulates the growth of the endometrium. Ovulation is the release of a egg (ovum) from its follicle which occurs approximately mid-cycle. Following ovulation, the corpus luteum forms from the remains of the follicle and secretes a hormone, progesterone. 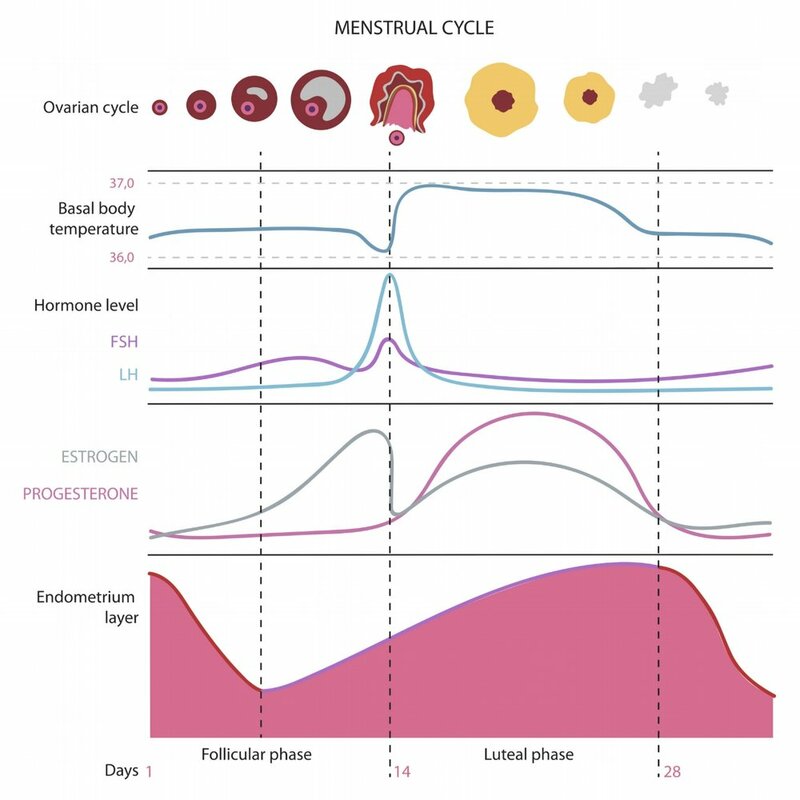 In the second half of the menstrual cycle, known as the luteal phase, progesterone levels rise and help to prepare the uterus for implantation if the egg was successfully fertilised. If pregnancy does not occur, the uterine lining is shed (also known as a period or menstruation) and a new menstrual cycle begins. Female hormonal disorders and imbalances are becoming more common. They range from symptoms such as PMS, painful periods, lack of periods (amenorrhoea), heavy bleeding (menorrhagia) to more complex conditions like endometriosis, PCOS and fertility issues. Unfortunately, symptoms of hormonal imbalance are being normalised as part of "being a woman". So often, the only solution that women are offered is the oral contraceptive pill or pain medications, which really do not address the underlying cause of hormonal dysregulation at all. The good news is that hormonal conditions respond incredibly well to natural treatments. Correcting nutrient deficiencies can help alleviate PMS symptoms and period pain. Herbal medicines are useful in restoring endocrine function and hormonal balance. A diet rich in plant foods supports efficient detoxification, improves hormone balance and decreases inflammation. Given a nourishing environment, happy hormone balance is possible.